Dumpsters.net is the simple choice for dumpster rental. Dumpsters delivered directly to you and picked up when you are finished! Dumpsters.net is not a broker. We bring you directly to quality affordable dumpster rental companies. Deal directly with a local company and let them know exactly when you need the dumpster delivered and when you want it picked up. 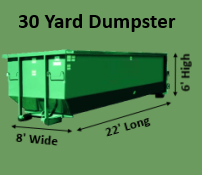 Rent your dumpster from a local hauler anywhere in the country. Our haulers will work directly with you to accommodate your needs. We pre-screen all of our dumpster rental companies bringing you peace of mind in the process of renting your roll-off dumpster. I found a lot of Internet brokers offering dumpster services but none of them could touch the price or service I got by dealing directly with a hauler. Dumpsters.net was the best place for me to find a local hauler I could trust.